I've long been a fan of Shinn Estate Vineyards, not only because of their wines but also because of their dedication to sustainable farming and push towards near-complete organic viticulture. Today on Appellation America, you can find an interview that I conducted recently with co-owner David Page. We touch on a wide range of topics, including their new estate winery, new winemaker, organic and biodynamic farming techniques, the Long Island Merlot Alliance and their push for highly aromatic wines. Read the interview and let me know what you think. And, please let me know if there are any members of the New York wine community that you are particularly interested in hearing from. Stony Brook University's Center for Food Wine, and Culture has just announced a cool new winter wine education session that you might be interested in. They are calling it Inside Wine: From Vineyard to Glass and it is on Thursday evenings from 7:00 - 8:30 p.m. on January 25 and February 1, 8 and 15. The cost is $185 per person for all four sessions. Just a little peak at our Xmas Eve menu..and a shot of the amuse bouche I put together with Nena's addition of mint-walnut pesto. It's something we'd done before, but the red and green seemed appropriate for the meal. My buddy over at WhiteTrashBBQ blog has put together a nice little list of NYC food bloggers. Some are my favorites and others I'd never heard of before now. Even though I'm out on Long Island (there aren't many, if any other LI food/wine bloggers) I consider myself a part of the NYC culinary blog scene -- whether I've met any of them yet or not. Maybe in 2007 we'll start to do some of the cool things that our Bay Area blogging counterparts do. You know, foodie functions and the like. Maybe I can help facilitate a meet up at one of the wineries here on LI? Any of you NYCers up for that? 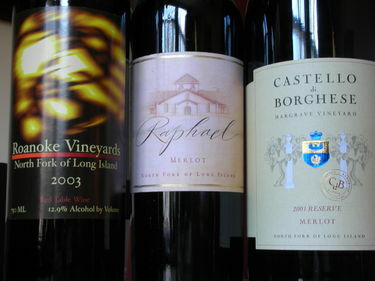 As 2006 comes to an unseasonably warm close here on Long Island, I thought it a good time to list and highlight some of my favorite Long Island wines of 2006. Over the past few years, local winemakers have really started hitting their stride, crafting some of the best wines ever made on the East Coast. The best wines are still ahead, but these are the best ones I tasted in 2006. You'll notice that I didn't highlight any rose in this column. That's just because I like rose super-fresh and just-released and because many of the best have sold out already. But fear not, the 2006 roses will be released in only a few months. Look for those from Channing Daughters Winery, Wolffer Estate, Roanoke Vineyards and Lieb Family Cellars. That is how much money we raised during A Menu for Hope. That is how much money we'll be donating to the U.N. World Food Program. And we have you to thank. Your generosity this holiday season was imply amazing. If you donated, thank you, and make sure you visit Chez Pim on January 15 to find out if you won any of the raffles. Appellation America's Regional Correspondents (myself included), embarked on a year-long search through North America’s widely diverse wine growing regions and discovered some most interesting palette pleasers, representing a style of winemaking focused primarily on "taste of place." There are many unique winemaking styles from when and how to press grapes, to the selection of fermentation yeasts, and temperatures. Appellation America’s Regional Correspondents, all widely respected wine journalists based throughout the nation, focused their Wine Recommendations on a style of wine making unique to the wine-growing region itself--its history, micro-climate, or terrior. The purpose of this list is not to dictate what one ‘should’ drink. Appellation America encourages wine lovers to use this list as a map to taste their way across the abundantly diverse wine growing regions in North America. And, just maybe, inspire further exploration into wines within a desired region. 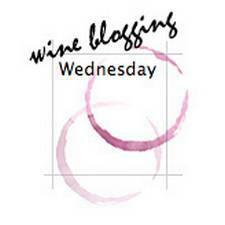 Wine Blogging Wednesday #29 Announced! What sets these wines apart are their purity of fruit, and perhaps, freshness. Do you agree? Is there a profile for these wines? Because of the holidays, we've pushed WBW to the third Wednesday in January this time around. So, join us on January 17 and drink biodynamic in 2007. To get the details and to learn more about biodynamic practices, visit F&B's announcement page. Nena, Ben, and I wish you and yours the merriest of Xmas seasons and the happiest of all holidays. We're in upstate New York visiting Nena's side of the family. We had a delicious Xmas Eve meal last night -- with plenty of delicious vino. Of course the bottle that I wanted to share with everyone last night was corked, but we I'll talk more about that tomorrow. For now, I'm going to enjoy my mother in-law's homemade apple sausage and a vegetable fritatta. Merry Xmas everyone. Regular blogging will resume tomorrow. Today is the last day that you can donate to A Menu For Hope, an amazing collaboration of the world's culinary bloggers. This morning when I checked the donation site, we had raise nearly $39,000 -- which means that you have already shattered my expectations. Thank you for your generosity thus far. But, this thing isn't over people! Donations are being accepted the rest of the day today and there are new prizes being added every day. Many of the Long Island wine-themed prizes I put together only have a handful of people in the running, so your chances of winning are VERY good. Is the Town of Southold Supporting Wineries Like it Should? I heard through the grapevine this weekend (yes, pun intended) that the Town of Southold is trying to change the way that it taxes orchards, farms and wineries by charging them a separate commercial tax as "processors." So, if an apple orchard just picks and sells apples, it's not going to be taxed more. But, if they make apple cider for sale at their farm stand, that means a higher tax. Same is true for a corn farmer...if they roast corn to sell at their farm stand, they have to pay more. Seems a little ludicrous to me. And, apparently they want to treat wineries/vineyards differently still...because they don't see them as agriculture. Grape growing isn't agriculture? Seems to me that local government should be supporting and protecting the East End farm industry, regardless of what is being grown there. But maybe I'm not getting the full story. I'm trying to dig up more information on this topic, so if you've heard anything, let me know. For the first time in my life, I find myself completely done with my holiday shopping and it's not even December 20 yet. Typically, I'm the guy who waits until today to start his shopping and finishes up around Xmas eve. If you're I usually am, check out the 2006 canvas magazine holiday gift guide. There are a lot of cool, unique gift ideas and I bet you can order them today and get them just in time. Ah yes, the holiday season. It overflows with extra food, extra family time and – if we’re lucky – lots of extra drink to get us through that extra family time. Of course it also brings the ubiquitous holiday party as well – thrown by your neighbor, your friends, your boss or, again, your family. This time of year, it seems like everyone I know asks me for suggestions on what wines they should take to all of those parties. Maybe your friends try to serve you koolaid-like white zinfandel or cheap, way-too-simple-for-the-holidays Aussie shiraz with a furry creature on the label. Heck, maybe they *gulp* try to serve you wine in a box. Or, on the complete flip side, perhaps you’ve been invited to the home of a real wine aficionado and you don’t want to bring a crappy bottle of plonk and embarrass yourself. I’ve been in each of these situations and trust me, there is a solution to every vinological quandary – and you can find them right on this overgrown sandbar that we call Long Island. Just follow these tips and suggestions. First, don’t stress out. This is the holidays, a time rife with enough stress that what wine to bring to a party shouldn’t cause more. They are supposed to be fun, remember that if you remember anything. Think food friendly and affordable. This is particularly true if you’re going to a larger, more casual shindig. Don’t spend a lot here – you never know if it’s going to be opened as soon as you walk in or who will be drinking it. Try to pick a food-friendly, versatile wine, that will go well with a wide range of foods. Macari Vineyards 2006 Early Wine ($15) or Raphael 2004 Estate Merlot ($16) are terrific options here. Avoid embarrassing the host. Sure, the wine he is serving is terrible – but you don’t need to rub it in. Bring your own wine and dodge the plastic cup of box-wine “Burgundy” by saying “Hey, a friend of mine told me about this wine and I thought I’d open it tonight. Do you want to try it?” Nine times out of ten, you’ll be drinking the good stuff in no time. Impress your boss. She has a cellar filled with the best Bordeaux, California Cabernet Sauvignon and White Burgundy. Of course, you don’t want to spend that kind of money – and she knows more about them than you anyway. My guess is that she doesn’t know much about Long Island wine, or if she does, she doesn’t know that there are world-class wines made here. Pick up a bottle of anything labeled “Grand Vintage” from Paumanok Vineyards, anything “Old Vines” at Lenz Winery or anything red at Roanoke Vineyards. They will cost you from $30-60, but this is your boss. She has control over your annual raise, right? When in doubt, bring bubbly. Sparkling wine is welcome at any party. Find me a party where it’s out of place and I’ll show you a seriously lame party. Wolffer Estate, Lenz Winery, Lieb Family Cellars and Martha Clara Vineyards all have terrific sparklers. Plus, yours will be the only bottle of local bubbly at the party. Just don’t call it Champagne. Give the gift of wine too. 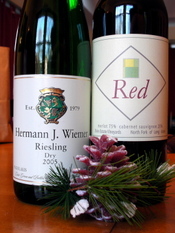 Wine is a terrific gift outside of parties as well, especially if it’s thoughtfully packaged or is a little different. Peconic Bay Winery makes one of my favorite local Rieslings and right now they are offering gift packs with one bottle each of their 2000, 2003 and 2004 vintages for $75. These vintages aren't available anywhere else and there are only 30 of these packs available, so get one today before they are gone. Or, if you want to get something for your favorite Long Island wine writer (it’s me, right?) feel free to buy me one. Or, their Cabernet Franc two pack or Chardonnay three pack. Osprey’s Dominion offers similar flights. This time of year is also a good time to think of those less fortunate than ourselves. Donate. Friday is the last day to donate money to A Menu for Hope, so don't forget to make a donation and put yourself in position to win one of the dozens of great food- and wine-related prizes. It looks like quite a few of the prizes I've put together are still ripe for the winning, with only a few people trying for them right now. Every time I read through the prizes again, I'm proud of the generosity on display. 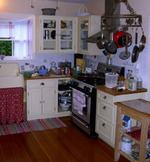 Long Island B&Bs have donated nights at their beautiful inns. Wineries are offering wines and private tours that you can't get anywhere else. Give what you can this holiday season. "Yes, California does produce some good merlot, though I could make a case that better merlot is coming from Long Island than from California, albeit in very small amounts." 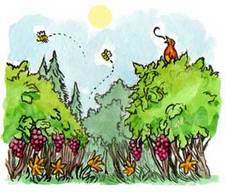 So says New York Times wine writer and wine blogger Eric Asimov in this week's column "Panned on Screen, Merlot Shrugs and Moves On" Of course, the rest of the column goes on to sing the praises of Washington State as America's best source for merlot. I'm not as familiar with Washington merlots as I am Long Island ones (obviously) so I'm not going to comment on that. But, that doesn't mean I don't have something to chime in with here. First, I've become a big fan of Asimov's over the past year or so -- and not only because he seems to have "come around" to my way of thinking on the topic of Long Island wine. I think I have his blog, The Pour, to thank for my change in thinking. As is the case with any good blog, it offers a window into his true self. The more casual, engaging style he writes with there has really drawn me in. Two -- it is great to see such a qualified and well-respected wine columnist mentioning Long Island wines in such high regard...which leads me to my third and final point here. Since this story ran Wednesday, I've gotten emails from at least five wineries (and countless others from readers and friends) talking about this quote. The overall sentiment seems to be "Take that California", but that is just ridiculous. Does anyone really think that California merlot (in general) is that good to begin with? It certainly isn't the grape they do best, or second best, or third best. Now, if someone were to say that Long Island cabernet sauvignon is better than California or Long Island zinfandel is better than California -- THAT would mean something. Of course, no one grows or makes zin here, so that isn't gonna happen. What I'm trying to say is -- yes, it's great that Asimov thinks Long Island is making great merlot, I'll never dispute that. But, isn't being better for merlot than California is a bit like being better at a hamburger than McDonald's or better than Pizza Hut at pizza. California shouldn't be the benchmark here -- even though it is for many people. 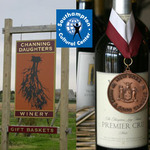 Long Island can, does, and will continue to do much more than just best California at merlot. Trust me. Wine Blogging Wednesday is here yet again, with Brenda aka the Culinary Fool playing the role of hostess with the mostest. The theme -- Sparkling Wine not from Champagne. I love many of the local sparklers here on Long Island. Our relatively cool growing conditions seem to lend themselves to the craft of methode champenoise. But which bubbly to choose for WBW? A new release caught my eye...and my palate as well. Martha Clara Vineyards, named after Martha Clara Entenmann (of Entenmann bakery fame), might be best known for their always-fun events and always-packed tasting room, but winemaker Gilles Martin has been raising the quality of the wines as well. Sure, they still make the ever-popular and sweet Bernie (the beagle) rose and some other wines geared towards the white zinfandel set, but those wines are becoming the exception to the rule. And, with a set of new sparklers just released Martin has made New Year's Eve wine shopping easy. Just go to their tasting room and pick them all up. Perhaps the lightest coppery-pink I've ever seen, Martha Clara Vineyards 2001 Brut Rose ($25) is made with both chardonnay and pinot noir -- traditional all the way. More fruity and a bit richer smelling than Martin's non-vintage Brut or 2001 Blanc de Blanc, the nose has a little toasty-bisquity character, but cherries and citrus dominate the nose. Dry, but just a little soft around the edge, the flavors of cherries and raspberries live within a slightly fuller-bodied frame. A delightful, fun sparkler that I'd definitely drink again...and again. A hearty thanks to Brenda for hosting this edition of WBW. Stay tuned for the January announcement! Okay everybody. 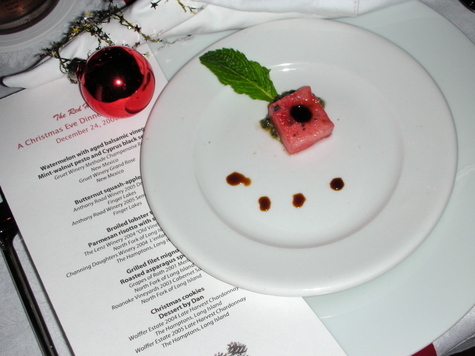 So far, the bidding on the Menu for Hope prizes I've put together has been a little slow. Maybe you're waiting until the end to see who is trying for what to increase your chances of winning. But...I, and Peconic Bay Winery, have decided to sweeten the pot a bit. So, I'm adding a bottle of the Peconic Bay Winery 2000 Cabernet Franc to the "Big Reds of Long Island" prize and adding a bottle of their 2001 Steel Fermented Chardonnay to the Romantic Weekend prize. Both are library selections that are no longer available anywhere else. Donate people...it's for a good cause and these prizes will make great gifts this holiday season! Donate and Win the "Big Reds of Long Island"
In case you missed it, I'm participating in A Menu for Hope again this year. We've already raised over $10,000, so thanks to each and every one of you who have donated already. For those of you that haven't, I'm going to highlight some of the Long Island wine-related lots that are available as raffle prizes. "Cabernet franc (48%) dominates this blend with 32% cabernet sauvignon and 20% merlot added to the final wine. Extremely aromatic — because of that cabernet franc — violets, berry fruit and vanilla oak intermingle in a tempting nose...this blend is still concentrated and rich with berries, plums and spice...well suited to some cellar time..."
You'll also win a magnum of Castello di Borghese 2001 Merlot -- from one of Long Island's best vintages ever. I can't find my tasting notes on this one (might have been pre-blog) but CdB is one of Long Island's well-regarded producers. I'm sure this wine will show well today or aged for even longer. Last and certainly not least, you'll receive a three-liter (yes, that's a big bottle) of Raphael 2001 First Label Merlot. Again, I can't find my tasting notes, but this is a spectacular bottle to have and to hold onto for a while. I've got several regular-size bottles of this wine in my little cellar, so you know i like it. So go to my previous post and get the instructions on how to wine this or any of the hundreds of awesome prizes being offered by food and wine bloggers from around the world. And, if anyone is looking for a last-minute gift idea for me...this red wine trio would be perfect. Today is WBW #28: Non-Champagne Sparklers, hosted by the Culinary Fool. With so much going on in the culinary blogosphere this week, I thought a morning reminder was in order. I'll be posting tonight with my entry -- a local Long Island brut rose sparkler that I really like a lot. Join us today and head over to Culinary Fool for the round up soon. Last week I wrote about Clovis Point, one of the North Fork's newest wine labels, but I didn't say much about the wines themselves. And many of you didn't like that too much. I must have gotten at least ten emails saying "what about the wines, Lenn?" 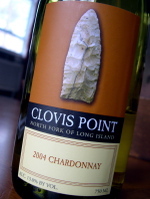 Clovis Point’s 2004 Chardonnay ($13.50). This wine was fermented mostly in stainless steel with just a little barrel-fermented chardonnay and Gewürztraminer added. With bright fruit, super-subtle barrel notes and nice balance at this price point, this was my favorite of the three wines. The Gewürztraminer brings a liveliness and spice that might be quite refreshing once the weather warms again. For now, enjoy it with seafood and appetizers. Clovis Point’s 2004 Barrel Fermented Chardonnay ($22.50). As its label would imply, this one was fermented and aged in French oak. The nose offers vanilla-roasted apple, pear and subtle tropical aromas. Overall, it's a bit quiet and might not be showing as well as it will in another year or two. Apple, pineapple and nutmeg flavors reside within medium body, but the finish is watery and flat. Clovis Point's 2003 Merlot ($18.50). This is a blend of three different clones of Merlot (181, 1, 314) with some cabernet franc and petit verdot blended in. I found cherries, oak and a little spiciness on the nose. This wine is definitely a lighter-style merlot than most, but it has nice berry-cherry flavors, low tannins and food-friendly acidity. I’d call this a “pizza and pasta wine” but that has negative connotations. Think of it as an everyday red that will go with a wide range of foods — but it's certainly not a big, bold red that is going to put Clovis Point on the map. Are You a Serious Eater? I Am. It's rare that I publicize new food/wine websites and blogs. There are just SO many that launch every week that I'd have to be insane to try to keep you up to date on all of them. But, every now and then, one comes along that I think is worth pointing out. Doesn't seem like there is anyone writing about wine there yet, but hopefully they'll get Alder or Derrick or someone to join the team. As a resident of the great state of New York resident, I have at least somewhat ready access to a plethora of great local Rieslings. German -- particularly those from the Mosel -- are my absolute favorites, but the Finger Lakes region is responsible for what I consider to be the best bottles this side of the Atlantic Ocean. Truth be told, vinifera grapes shouldn't succeed in central New York. But, the narrow, deep Finger Lakes gather and hold enough heat in the summer to stretch the growing season into the fall and stave off early frosts. As anyone who has ever visited the Finger Lakes knows, quality varies greatly from producer to producer. 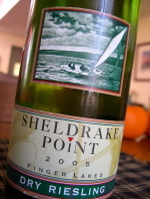 You might have to taste five or ten sweet, one-dimensional Rieslings before getting to one like this 2005 Dry Riesling from Sheldrake Point . A light yellow in the glass with a subtle greenish tint, the nose is fresh with ripe, crisp apple and lemon zest aromas accented by brown spice notes. Balance is the key to any great Riesling and winemaker Dave Breeden achieves that here. This is a dry, light, clean wine with citrus flavors up front that turn to green apple and pears on the finish with just a little mineral quality. Fresh, palate-cleansing acidity balances the substantial fruit flavor here. Very well done and a great choice with anything from Thanksgiving turkey to Chinese takeout to Mexican food (a new favorite pairing).